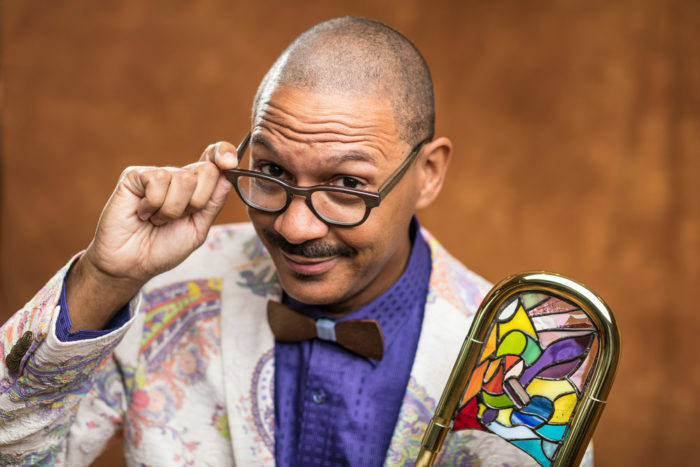 Delfeayo Marsalis is one of today’s top jazz trombonists, composers and producers. He shares with his father, Ellis, and brothers (Branford, Wynton and Jason) the nation’s highest jazz honor: National Endowment for the Arts’ Jazz Masters Award. Delfeayo is perhaps the most traditionally New Orleans of the Crescent City’s first family of jazz, known for his technical excellence, imagination and humor. Born in New Orleans in 1965, as a kid Marsalis gravitated towards the trombone, which he calls “an extension of my personality.” He received formal training at New Orleans Center for Creative Arts high school, Tanglewood Institute, Berklee College of Music, and University of Louisville, but growing up in the Marsalis household was a school of music and life unto itself. Early on, Delfeayo was mesmerized with the recording process. “Branford showed me how to create a feedback loop on a reel to reel machine and I was hooked! When I was in seventh grade, Wynton challenged me to create home recordings of him that had the same quality as trumpet virtuoso Maurice Andre’s classical studio recordings. It was all trial and error and I discovered a process and logic that I still use today.” Delfeayo recorded demo tapes for his brothers and schoolmates and served an internship at pianist Allen Toussaint’s studio. Marsalis has produced over 100 recordings for major artists including Harry Connick, Jr., Terence Blanchard, the Preservation Hall Jazz Band and, of course, his father and brothers. In addition to touring internationally with his own groups, Marsalis has worked with five renowned bandleaders. “Art Blakey taught me patience and purpose in soloing. Abdullah Ibrahim’s sense of harmony is prevalent in much of my music. Slide Hampton inspired me with his extraordinary command of the trombone and the language of jazz. Max Roach played with conviction and dexterity all the time. Elvin Jones taught me about humanity, expressing myself through music, and most importantly, how to keep time.” The lessons of these legendary artists can be heard throughout Delfeayo’s compositions and improvisations, and on records like 2010’s stunning Sweet Thunder, which gives the Duke Ellington/Billy Strayhorn suite “Such Sweet Thunder” a modern, inspired makeover, earning a place on numerous Top-10 lists of the year. Tulsa Roots Music is proud to present the Delfeayo Marsalis Quintet at our inaugural FETE.